Washington Post journalist David Fahrenthold is investigating the Trump Foundation -- and simultaneously showing how to involve readers in the reporting process. Other journalists say Fahrenthold's work is inspiring. Some have dubbed it Pulitzer worthy. Its impact was reinforced on Tuesday when President Obama cited the reporting while stumping for Hillary Clinton. While the Clinton family foundation "has saved countless lives around the world," Trump's foundation "took money other people gave to his charity and then bought a six-foot-tall painting of himself," Obama said. The curious case of the portrait was revealed in a front page story by Farenthold on Sunday. Fahrenthold didn't hear the speech live. He was head down at his desk. When he got up to get coffee, a colleague filled him in. Then he tweeted: "Reminder: I am still looking for this portrait. Neon colors, black background, six foot tall." The past few days have been a whirlwind for Fahrenthold. The Atlantic's James Fallows called him a "strong candidate for 2016-cycle press MVP." "Fahrenthold is doing god's work," Olivia Nuzzi of The Daily Beast tweeted. "You're like Indiana Jones," CNN's Jake Tapper said after interviewing him on Monday. During his media tour on Monday, he joked that he only owns one suit and nice shirt, so he "can't look nice on TV again for a week." But on Tuesday he was back at it, appearing on CNN, the PBS "NewsHour" and elsewhere. His wife went to Brooks Brothers to buy him a few more shirts. "All this media attention has brought a lot of new tips in," he said Tuesday afternoon, sounding eager to get back to work. He published two more stories on Tuesday night. One was about how CNN had solved three "mysteries" from one of his earlier stories. Another was about how the New York attorney general has opened an "inquiry" into the foundation. Then he popped up on the "Today" show on Wednesday morning. Fahrenthold's Twitter account has become one of the surprise sensations of the election year. Six months ago he turned to Twitter while trying to verify that Trump had, as promised, given away $1 million to veterans organizations. He wanted the search to be as public as possible, believing that would help him get answers. Other reporters, and regular readers, amplified his tweets. In May, as the pressure mounted, Trump donated $1 million. Fahrenthold, 38, joined The Post in 2000. His past beats have included D.C. police, Congress, and the federal government. The stories about Trump and vets groups were some of the highest-profile stories of his career. While the investigation into the vets donations was still going on, The Post's executive editor Marty Baron told him, "You should look at the foundation next." Fahrenthold has been on the beat full time since June. And he has had scoops left and right since then. Earlier this month he reported that "Trump paid the IRS a $2,500 penalty this year" after it was revealed that the foundation "violated tax laws by giving a political contribution to a campaign group connected to Florida's attorney general." The A.P., CNN and other outlets have been pursuing stories about the foundation as well. Some of Fahrenthold's breakthrough work has focused on whether Trump has, as he claims, "given millions away" from his own pockets. 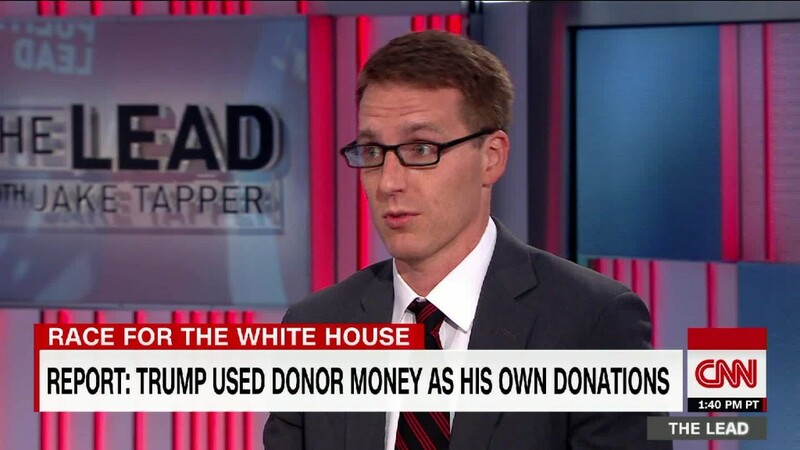 Since Trump has not donated to his own foundation since 2008, Fahrenthold has been homing in on personal contributions. He hasn't found many. Actually, he has only found one. "Between the end of 2008 and this May, I found one donation out of his own pocket. That was for less than $10,000 back in 2009," he told Tapper on Monday. He says it may be a book-keeping error. Fahrenthold has taken his Twitter followers on the journey by tracking his work on an old-fashioned pad of paper which he tweets photos of. He makes lists of charities -- he has called 326 so far -- and records the last time Trump donated. In most cases the answer is "never," written in black link. Occasionally he records a donation date in red ink. "I needed to find a way to make futility look interesting," he explained. By making a list and using different colors, "you can see it all at a glance." Fahrenthold said he found that "the magic of Twitter is, you can show people your progress along the way." As NiemanLab recently noted, the reporter's frequent tweeting also exposes his work to Trump and to many other reporters. Fahrenthold has also used the social networking site to educate readers about meticulous reporting methods -- making them feel like a part of the effort. When he sends questions to the Trump campaign, he screen grabs the email and tweets it, so followers can see that he's trying and judge the campaign's response accordingly. While Hillary Clinton's campaign has an extensive P.R. apparatus, Trump has a relatively small number of P.R. aides. "They often don't respond at all," Fahrenthold said, although the aides have become somewhat more responsive recently. Fahrenthold's editor at The Post, Steven Ginsberg, said what stands out is "how relentless Dave has been in reporting the story — his refusal to take 'no comment' for an answer — and how creative he has been in presenting it in The Post and on social media." In an email, Ginsberg said he feels that Fahrenthold "has pioneered a new way to hold powerful people to account that will endure well beyond this story and this election." Fahrenthold said that what attracted him to the project in the first place was the verifiable nature of donations. "It's so hard to cover Trump," he said. "What Trump says, what he feels, what he thinks changes from day to day." So Fahrenthold has been asking nonprofit groups for information instead. "What I liked about this was that there's another party in the transaction," the charities themselves, he said. "I could establish the facts on the ground without relying on Trump. That's what was satisfying about it." And he sees no end to the story anytime soon. On Wednesday morning he updated his followers on the portrait hunt: "Nothing yet. Found a lot of other Trump portraits, but not this one."